Unexpected. Cold. Unfair. Three words that accurately describe that door just shut against your face. Should you be happy? Throw your head back, laugh without inhibition, go back home, plop on your bed, and think about how good it felt? To the plain mind, that's crazy and foolish. Why should you be happy? Why should your head be lifted high? Why should you thank God for a closed door? What you asked for was that the Lord open this door for you. This would have been your perfect entrance to that breakthrough you've been praying for. That lone drop of rain you've been thirsting for this whole time. 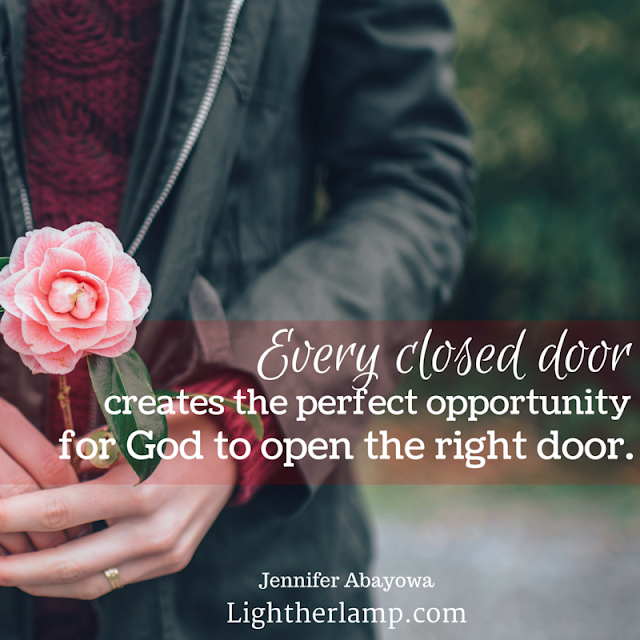 Dear, what you may not know is that every closed door creates the perfect opportunity for God to open the right door. I don't know about you, but the best things that have happened in my life occurred after closed doors. Dashed dreams left in God's hands became beautiful in their own time. Failed relationships opened the doors to the best one ever. Old career paths budded and became the unexpected and yet best one God had in mind all along. So I've learned that as long as I am sold out to the One who wrote my name in the palm of His hands, the One who calls me the Apple of His eye, I am good to go. I've got nothing to worry about and everything to hope for. I want to pass on this same confidence to you today. What you think is a closed door could be the best thing that ever happened to you. 2. Eat Again. "But when David saw that his servants were whispering together, David perceived that the child was dead; so David said to his servants, "Is the child dead?" And they said, "He is dead." So David arose from the ground, washed, anointed himself, and changed his clothes; and he came into the house of the LORD and worshiped. Then he came to his own house, and when he requested, they set food before him and he ate." (2 Samuel 12:19-21, NASB). 3. Ask the Helper for a Redirection. "The Helper, the Holy Spirit, whom the Father will send in My name, He will teach you all things, and bring to your remembrance all things that I said to you." (John 14:26, NKJV). So many times, I thought I knew what was best. Little did I know that God had designed the best and I only had a limited view of what my life would be. So the next time you get a closed door, I pray you remember this. Labels: Choices, Choose, Choosing, Destiny, Direction, Miracles, Purpose, Writings about ME. 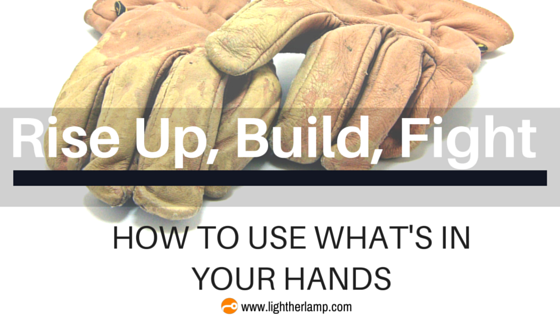 How can you use what's in your hands? You look around you, and you see so many people doing things in a specific way - the way it's always been done. "It's just the way things are done, I shouldn't be different. Or should I?" you ask. 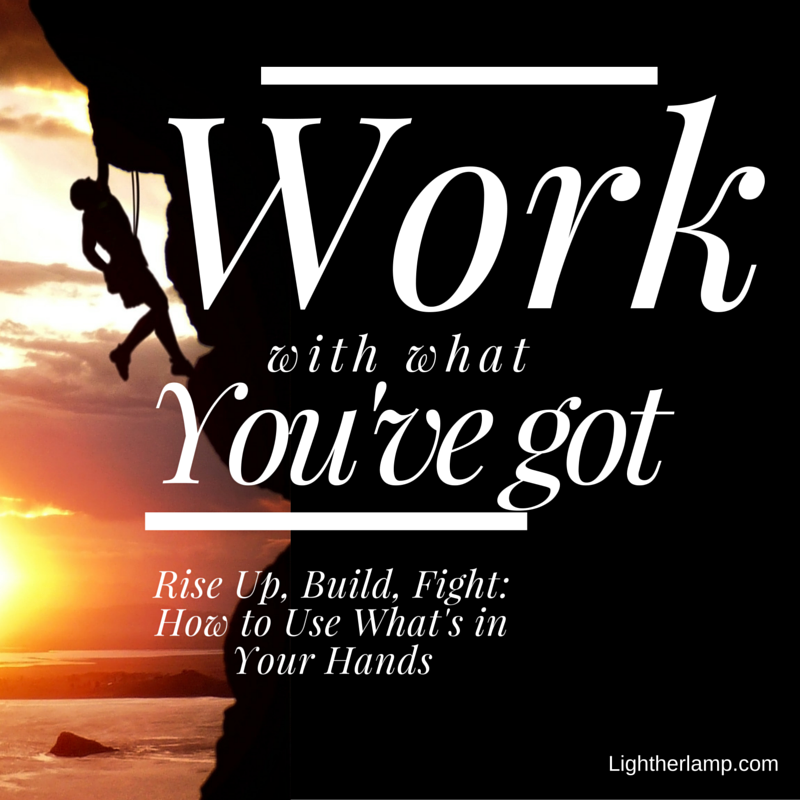 Today, I'd like to suggest that you can definitely use whatever is in your hands to do what God has called you to do. Many prodigies and innovators have risen up without a single formal training. So what are you waiting for? 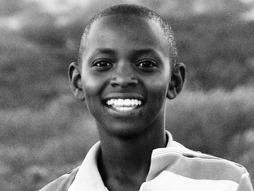 Today, I want to share the story of a young Maasai boy, Richard Turere, who lives in the south side of the Nairobi National park. The Maasai people are herders by tradition. They believe that they came from heaven with all their animals and they have a responsibility to take care of these animals. In the Maasai community, boys aged six to nine are given full responsibility over their father’s cows. So when Richard woke up one morning to find that the only bull amongst his father’s cows had been killed by a lion, he was deeply pained and took the battle into his own hands. But here’s why I’m sharing this story. Richard did not try to look for battle gear that someone else has already made. He put his imagination to play and tried to come up with something made with his own hands. He looked for what was available right there in his own home. He reminds me of David as a little boy. All he knew was the power of his God. David knew that God could save anyone, through anything. He could not handle heavy spears or swords at his age, but he could handle stones. And if God could save through bare hands, then God can save through stones. So the Maasai boy put his imagination to work. He thought of several ideas before finding one that worked. At first, he thought about using fire or a scarecrow, but the lions were too clever for that. Finally, one night he walked around with a torch and the lions did not come as they usually did. This was the turning point. He finally realized that lions are afraid of a moving light and he decided to create something that depicted a moving light. You can watch his solar-powered invention here. Again, why am I sharing Richard’s story? Some of us have more than we need to create. To imagine. To dream big. But we are not maximizing our potentials. Our Father is the Master Architect. He created this earth out of nothing but darkness. He looked at darkness and thought, “Surely, I can do something with this,” and He said, “Let there be light.” And there was light. And so, my encouragement to you today is that you need to open your hands and look for what God has placed in them. Use everything you’ve got. Don’t look at what other people have. What has God been training you for? What has He been teaching you? Take these things and do something with it. If you've been wondering how you can achieve what God is asking you to do in this season, the question you should ask yourself is "What's in my hand?" Open your hands and look. I pray you will find the answer in Jesus' Name, Amen.